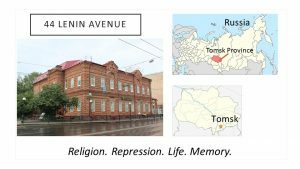 The Tomsk Local-Studies Museum (right across the street from 44 Lenin Avenue) has put together an on-line exhibition of photographs of Tomsk from the “February” Revolution of 1917, when Tsar Nicholas II was overthrown. There are many fascinating photographs, mostly street scenes of crowds and demonstrations. 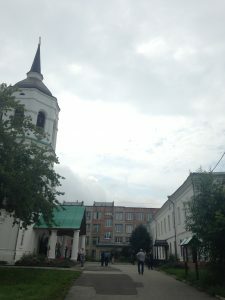 Since many demonstrations took place in the New Cathedral Square (diagonally across from 44 Lenina), many of the photographs include the cathedral, which is certainly an impressive structure. Good news on the “Stone of Sorrow” that was vandalized back in November. 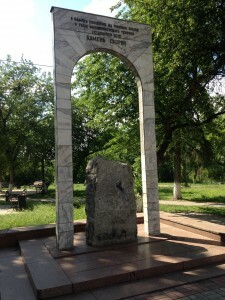 At first, police had reported that there was nothing they could do, because the stone wasn’t an officially designated monument, despite the years of ceremonies and the consecration of the monument in 1992. This decision had the staff of the NKVD Remand Prison Museum at 44 Lenin Avenue worried that anyone would be able to do whatever they wanted to the stone. Reports from yesterday, however, state that public pressure has had a positive effect: the stone has been labelled an object of cultural heritage: in other words, a monument that cannot be vandalized without repercussion. Below is a photo I took of the stone with my phone, Summer 2016. As touched on in several earlier posts (e.g. 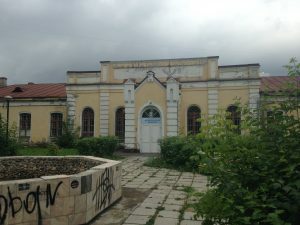 here and here), the building at 44 Lenin Avenue, from its humble beginnings as a church-parish school to its role as local NKVD headquarters to its transformation into commercial and commemorative space itself provides a compelling story. This story runs parallel to many of the main trends of Siberia and Russia’s tumultuous 20th century. For the early years and the later years of the building, the specific microhistory stories are themselves rather obvious. 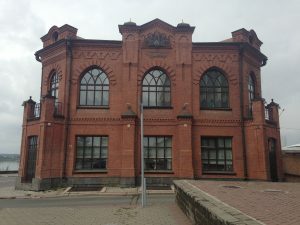 For example, the construction of the building connects to threads of education, religion, architecture, and Tomsk’s role in the Russian empire. The architect, V. V. Khabarov, was involved in numerous other projects–including the construction of the enormous Trinity Cathedral a stone’s throw from the parish school–that helped make Tomsk Siberia’s capital in the late-Tsarist period. Another compelling story is the 1909 murder of the school headmaster. 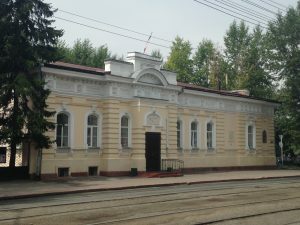 In more recent years, the founding of the Memorial NKVD Remand Prison Museum, or the visit of Solzhenitsyn to the building in 1994, also make compelling stories related to post-Soviet reckoning with Stalinist repression. 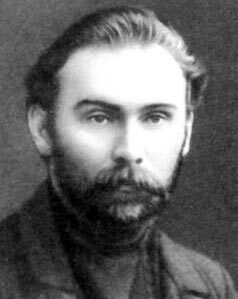 Nikolai Klyuev. Photo via Wikimedia commons. Public domain. 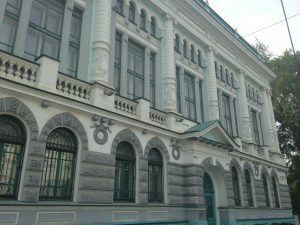 Even though the building’s infamy today largely derives from its role as local NKVD headquarters and remand prison during the height of Stalin-era repression, finding a specific, compelling story is proving somewhat difficult. Several famous prisoners spent time there, including philosopher Gustav Shpet and poet Nikolai Klyuev. 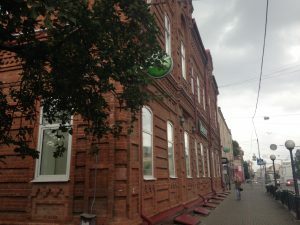 It is even quite possible authorities shot Kluev in the basement of the building, or in the underground passageway underneath the building’s small square. So, the story could move to biography at this point. Several NKVD bosses who spent time in Tomsk achieved infamy either there or elsewhere, including Ivan Ovchinnikov (the “local Beria”), Ian Krauze (better known for his NKVD work in Leningrad), and Ivan Maltsev. The stories linked to the building seem so male dominated (the basement murder, Solzhenitsyn’s visit, and so on), and biographical stories related to the building during its NKVD incarnation risk continuing a trend. In any case, as a historian, it is my job to find a story that is both compelling but also representative, or, perhaps, exceptional, but exceptional in a way that leads to important information and analysis of the time in question. I wonder what NKVD stories will fall along these lines? Timothy Brook, Vermeer’s Hat. In this book, Brook examines the increasingly globalized world of the 17th century through a series of paintings by the Dutch painter Jan Vermeer, all painted in his studio in the town of Delft. Brook uses these paintings as windows into broader currents of global history. The paintings are thus a fun and useful narrative device to tell stories as far apart as a shipwreck of a Portuguese vessel off the coast of China, to Champlain’s search for a waterway that would take him through North America. Ivo Andric, The Bridge on the Drina. Andric’s book is historical fiction, but follows the history of Bosnia and the Balkans from the 16th century to World War I by examining the life of the bridge, and the stories of those who were impacted by it. Andric paints a vivid picture of the importance of place, both how a place can affect the broader world, and how the broader world affects that particular place. Francois Girard, dir., “The Red Violin.” I really loved this movie when it came out in 1998, a series of vignettes all based around the many owners of a mysterious red violin. Like The Bridge on the Drina, this story spans several centuries. 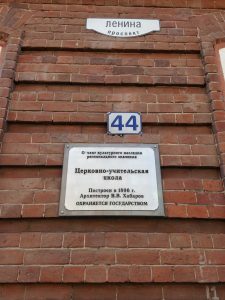 In the end, my method of storytelling in “44 Lenin Avenue” will hopefully resemble a layered microhistory, in which the story of the building is one such microhistory, and each event is its own microhistory. In this I am influenced both by Natalie Zemon Davis‘s classic, The Return of Martin Guerre, as well as Jill Lepore’s definition of microhistory as contrasted with biography (below), although I make no claim to even a tenth of their storytelling abilities. – Jill Lepore, “Historians Who Love Too Much: Reflections on Microhistory and Biography,” Journal of American History 88.1 (2001): 129-144, quotation on page 133. I haven’t posted much since the summer, in part because I am no longer “in the field.” Just a brief update, here. 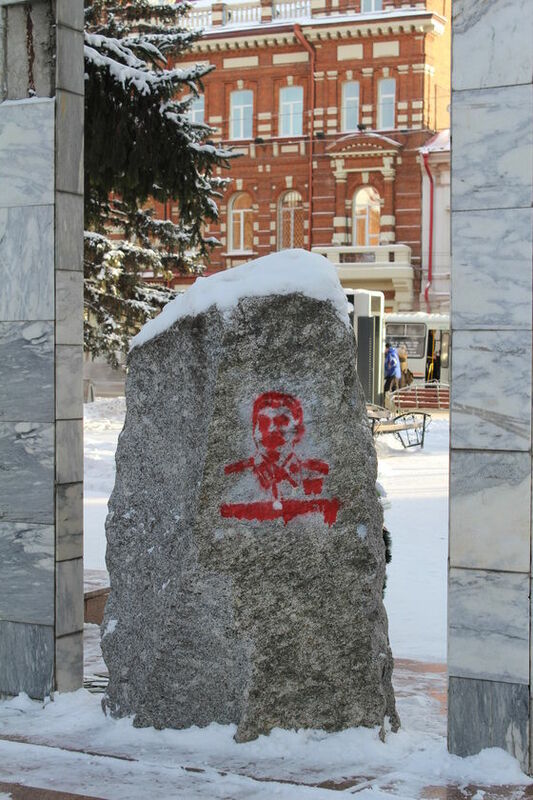 The monument “to the victims of Bolshevik repression” was vandalized just a few days ago, as someone used red spray-paint to place a bust of Stalin on the back of the monument. In some respects, I’m surprised this hasn’t happened more often. The monument is very visible, right in the centre of Tomsk, and Stalin himself has seen a bit of a resurgence in Russia over the last several years. Still, it’s a disturbing reminder of the contested memory of the Stalin era. 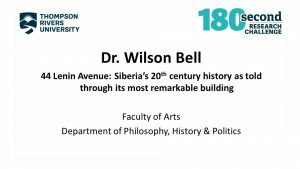 Just a quick note: thanks to a Twitter conversation with @kab3d, I have the opportunity to present at the conference, “Crime and Punishment at 150,” to be held at UBC in October (preliminary program here). 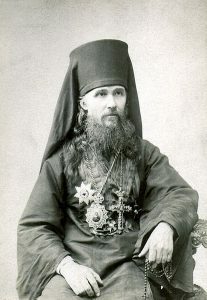 On the night of May 8/9, 1909 in the centre of Tomsk, Siberia, two students at the church-teachers’ school strangled their headmaster, the young monk and arch-reactionary Ignatii Dvernitskii. The murder shocked the town, with competing versions of the motives almost immediately offered in the local and even national press. The murder itself–the victim, the perpetrators, the location–quickly brings the interested observer to the themes of conservatism, anti-Semitism, student activism, religion, education, crime, and punishment in the reactionary period after Russia’s 1905 revolution. Curiously, however, one of the big debates at the time related to the influence of Dostoevsky’s Crime and Punishment on one of the perpetrators, a young man by the name of Gerasim Iurinov. Should we consider him a real-life Raskolnikov? Can Dostoevsky’s novel help today’s observer understand the murder of Ignatii Dvernitskii? The murder of Ignatii raises many questions, some of which were raised almost immediately by the St. Petersburg-based journal, Sibirskie voprosy (Siberian questions). The murder occurred the night of May 8/9, 1909, and the suspects were arrested on the 9th. Many supporters of Ignatii, according to Sibirskie voprosy, gathered around the school, calling for a pogrom (like the 1905 pogrom in Tomsk – subject of another post!) against the students of the school. The murder investigation concluded quickly, and it was passed to a temporary session of the military district court. The court heard the case in November, 1909, and the two students were sentenced to death, commuted to katorga.